Owen Mundy is an artist, designer, and programmer who investigates public space and its relationship to data. His artwork highlights inconspicuous trends and offers tools to make hackers out of everyday users. He has completed multiple networked art works including Give Me My Data, a Facebook application to reclaim your usage data; Commodify.Us, (They Make Money From Your Data, Why Shouldn't You?) 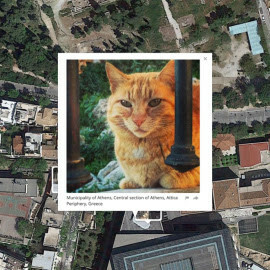 and I Know Where Your Cat Lives, a data visualization project to create awareness about internet privacy. Owen has an MFA in Visual Art from the UC San Diego and is an Associate Professor of Art at Florida State University. His work has been shown in Mexico, Ireland, India, Berlin, the California Center for the Arts, Compactspace in California, Flashpoint Gallery in Washington DC, and APEXART, Flux Factory, and Art Currents Gallery in New York. Owen's work has been profiled by NPR, the New York Times, The Atlantic, and Time Magazine, among others.